Buy Ben Briggs a Coffee. ko-fi.com/benbriggs - Ko-fi ❤️ Where creators get paid by fans, with a 'Buy Me a Coffee' button. Hi, I'm Ben! I'm a full-time musician, entertainer, and DJ best known for remixing video game music. I'm also the founder and incidental patriarch of Tiny Waves. Secured Payments. 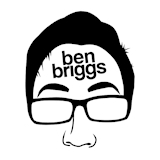 Support goes to Ben Briggs's account. Upgrade Ben Briggs to a yearly Gold Membership with a one-time payment.